Salicru’s SLC ADAPT series consists of modular On-line double conversion uninterruptible power supply (UPS) solutions with DSP control and three-level IGBT inverter technology. Flexibility: It enables solutions to be configured from 10 kVA to 1500 kVA, thanks to the range of modules available (30 and 50 kVA), different configurable systems (6 or 10 modules) and the parallel/redundant option of up to three 500 kVA systems. It also provides increased protection as needs grow - pay as you grow - thereby improving total cost of ownership (TCO). Availability: Its hot-swap modules can be added or replaced during operation, thereby improving mean time to repair (MTTR) and reducing maintenance costs. In addition, the system’s remote management, which can be integrated into any platform, also facilitates operation. And the extensive back-up options available, along with intelligent battery charging, ensure continuous operation of the protected critical loads. Reliability: Its DSP control, based on three-level PWM technology, improves response effectiveness and, along with shared load redundancy, significantly extends the mean time between failures (MTBF). Moreover, both the control display and the bypass module can be replaced without affecting the operation of the device. Data centres with all capacities, IT infrastructures, modular and virtualised data centres and applications for critical processes are some of the services that require high-level electrical protection to ensure reliable, continuous and high-quality operation, such as that provided by Salicru’s SLC ADAPT series systems. On-line double conversion technology with modular architecture. 30 and 50 kVA modules with DSP control and three-level PWM technology. 6 or 10-module systems (up to 500 kVA per system). 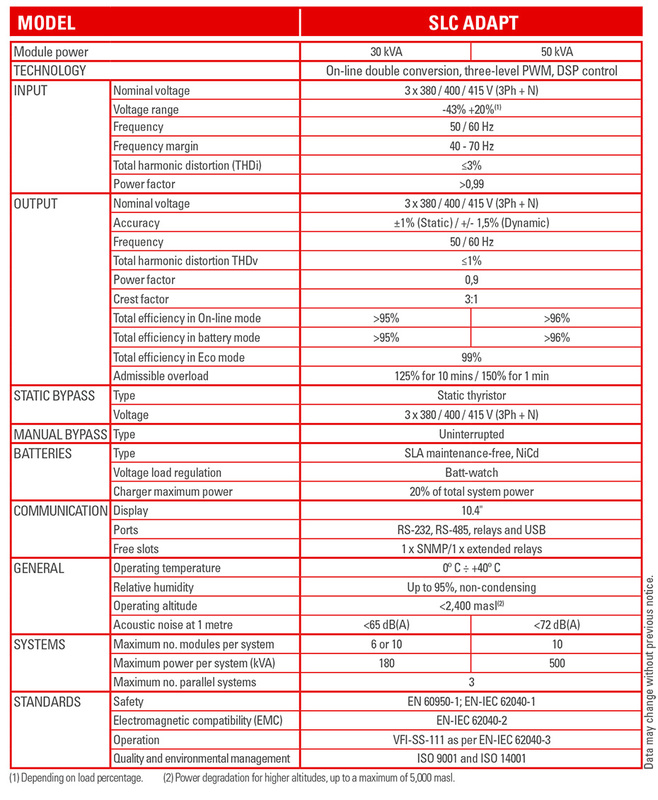 Possibility of parallel/redundant operation up to 1500 kVA. Hot-pluggable and swappable plug & play modules. Input current distortion (THDi) <3%. Three-phase input / output voltages. Output power factor = 0.9. Control and management by means of LCD display, LEDs and keypad. 99% performance in Eco-mode operation. RS-232, RS-485, relays and USB communication channels. Smart slots for extended relays and SNMP. Smart-efficiency mode to optimize system performance. Improved return on investment (ROI). 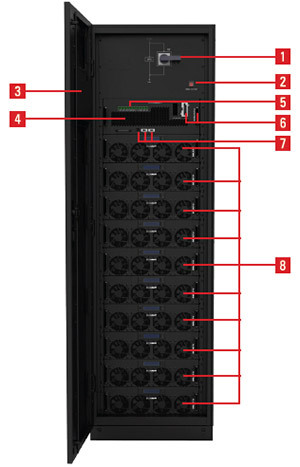 Compact design to save space in server rooms. (1) In systems 50 kVA modules. Extended relays and SNMP slot. RS-232, RS-485 and USB interfaces. Extended relays and SNMP adapter. Display consisting of operation keys, status LEDs and touch screen detailing all functions, measurements and alarms. Telemaintenance service by means of Internet connection with different modes: BASIC, MEDIUM, Premium and Premium Plus, which will allow notifying the customer in case of failure, monitoring the computer via Web, accessing to the equipment control, among others, avoiding thus unnecessary maintenance personnel journeys and reporting and solving problems before that the user notice them. SICRES adapter is required. Communications cable for simple or redundant parallel installations. A kit for installations needing to grow in power or redundancy in the system, enabling the different units to be interconnected. To convert the input frequency from 50Hz to 60Hz or vice versa. Batteries can be installed in case they are required. 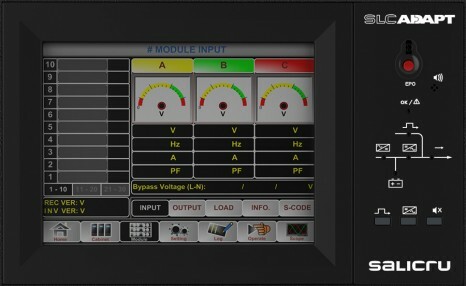 Remote panel shows the status of the UPS, in real time, by means of a touch screen, through the RS485 communication port. For facilities with dual power supply, enabling the separation of inverter and bypass line power supplies. Consult us for possible single/single-phase, three/single-phase and single/three-phase input/output configurations.